For Holy Leagues, see Catholic League (disambiguation). The founding countries of the Holy Alliance, against European boundaries as of 1840. The Holy Alliance (German: Heilige Allianz; Russian: Священный союз, Svyashchennyy soyuz; also called the Grand Alliance) was a coalition linking the monarchist great powers of Russia, Austria and Prussia. It was created after the final defeat of Napoleon at the behest of Tsar Alexander I of Russia and signed in Paris on 26 September 1815. The alliance aimed to restrain liberalism and secularism in Europe in the wake of the devastating French Revolutionary Wars, and it nominally succeeded in this until the Crimean War (1853–1856). Otto von Bismarck managed to reunite the Holy Alliance after the 1871 unification of Germany, but the alliance again faltered by the 1880s over Austrian and Russian conflicts of interest with regard to the dismemberment of the Ottoman Empire. Ostensibly, the alliance was formed to instill the divine right of kings and Christian values in European political life, as pursued by the Tsar under the influence of his spiritual adviser Baroness Barbara von Krüdener. About three months after the Final Act of the Vienna Congress, the monarchs of Orthodox (Russia), Catholic (Austria) and Protestant (Prussia) confession promised to act on the basis of "justice, love and peace", both in internal and foreign affairs, for "consolidating human institutions and remedying their imperfections". 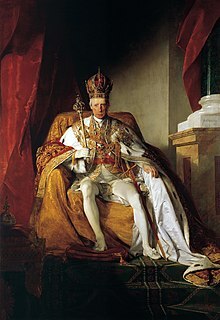 The Alliance was quickly rejected by the United Kingdom (though George IV declared consent in his capacity as King of Hanover), the Papal States, and the Islamic Ottoman Empire. Lord Castlereagh, the British Foreign Secretary, called it "a piece of sublime mysticism and nonsense." In practice, the Austrian state chancellor Prince Klemens von Metternich made it a bastion against democracy, revolution, and secularism (although it is said that his first reaction was to call it "a resounding nothing"). The monarchs in the Alliance used it to suppress revolutionary influence (especially from the French Revolution) and Enlightenment from entering their own nations. The Alliance is usually associated with the later Quadruple and Quintuple Alliances, which included the United Kingdom and (from 1818) France with the aim of upholding the European peace settlement and balance of power in the Concert of Europe concluded at the Congress of Vienna. On 29 September 1818, the Tsar, Emperor Francis I of Austria and King Frederick William III of Prussia met with the Duke of Wellington, Viscount Castlereagh and the Duc de Richelieu at the Congress of Aix-la-Chapelle to demand stern measures against university "demagogues", which would be realized in the Carlsbad Decrees of the following year. At the 1820 Congress of Troppau and the succeeding Congress of Laibach, Metternich tried to align his allies in the suppression of the Carbonari revolt against King Ferdinand I of the Two Sicilies. The Quintuple Alliance met for the last time at the 1822 Congress of Verona to advise against the Greek Revolution and to resolve upon the French Invasion into Spain. The last meetings had revealed the rising antagonism with Britain and France, especially on Italian unification, the right to self-determination and the Eastern Question. The Alliance is conventionally taken to have become defunct with Alexander's death in 1825. France ultimately went her separate way after the July Revolution of 1830, leaving the core of Russia, Austria and Prussia as Central-Eastern European block which once again congregated to suppress the Revolutions of 1848. The Austro-Russian alliance finally broke up in the Crimean War: though Russia had helped to completely destroy the Hungarian Revolution of 1848, Austria did not take any action to support her ally, declared herself neutral and even occupied the Wallachian and Moldavian lands on the Danube upon the Russian retreat in 1854. Thereafter, Austria remained isolated, which added to the loss of her leading role in the German lands, culminating in the defeat of the Austro-Prussian War in 1866. The Congress of Laibach was a conference of the allied sovereigns or their representatives, held in 1821 as part of the Concert of Europe, which was the decided attempt of the Great Powers to settle international problems after the Napoleonic Wars through discussion and collective weight rather than on the battlefield. A result of the Congress was the authorization of Austrian intervention in the Kingdom of the Two Sicilies in order to quell a liberal uprising.